Want to run bite-size training sessions, but would rather a professional trainer deliver them for you? We are able to provide experienced trainers who will deliver the sessions of your choice, at your premises, at a time that suits you using our own training materials. This minimises disruption, and ensures that your people are getting management skills training, personal effectiveness training, or sales and customer service training delivered by an expert in that area. 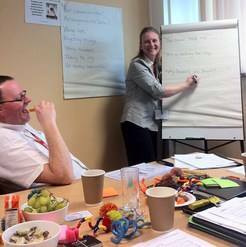 All you need to do is provide a suitable room and a flip chart! Or you can contact us on 07803165780 to discuss which training sessions you would like (click here for our full range), how many people will be included, and of course to arrange a suitable date. Our prices are for the number of sessions to be run on the same day are outlined below. Note the price is PER SESSION (NOT per person). Prices quoted are exclusive of VAT which will be charged at the standard rate. Note: There will be a £10 per person per session added on to cover the cost of producing delegate training materials - but if you prefer, you can print them off in-house. Any additional expenses such as rail fare, accommodation and mileage will be agreed in advance and recharged. Mileage is charged at 50p per mile. Cancellation Fees: We reserve the right to charge for events that are cancelled with less than 2 weeks notice. This fee will be a minimum of £50 and may be as high as 90% of the full fee, depending on the notice given.